Reality can deploy the latest user interfaces using RealWeb(DataBasic HTML) or via external interfaces like ODBC/JDBC, .NET, C, Web Services, TCP/IP Sockets. Some applications, however, do still require resilient and efficient text and function key based application interfaces, either as simple text and/or combined with GUI assisted buttons for pre-stored menus, functions, macros etc. RealLink for Windows – RFW provides this with [buttons] to drive user-key-sequence macros in order to maximise data entry efficiency. There are also more advanced GUI screen creation and data level features, like data interchange between Reality databases, applications and host platforms. For further information refer to the Reality Documentation, under under Other Documents and then Terminals and Printers. 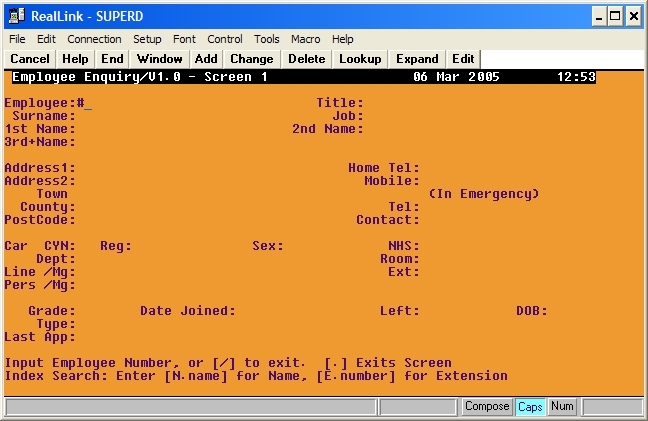 Here you will find example setup and coding covering Terminal Definition Maintenance, Connecting to Hosts, Command Line Editor, Macros to setup user defined buttons and Client to Host file transfer. Under UIMS(User Interface Management System) you will find how to interface with Windows applications in order to launch and exchange data with them using this advanced API. Note: This is a rewrite deploying .Net/C# running natively on 32-bit and 64-bit Windows. While it has a reduced feature set, when compared to RFW 3 described above, it has most of the Terminal Emulation elements to ensure not needing to retrain users or alter applications. There are also some enhancements, like a more responsive user interaction and introduction of SSH for secure access across insure networks including the Internet. Please contact us for further information regarding evaluation with your applications. e.g. Using Windows Virtual PC which requires h/w with Hyper-Threading Technology support – termed "h/w assisted Virtualisation" or "Hyper-T" in some PC BIOS setups. Refer to XP Mode for Windows 7, including a s/w update for XP Mode for systems without h/w assisted virtualization technology. Other virtualisation is available, for example Virtual Box.